The wind in the parking lot is blowing hard, blowing snow into our coats before we can get them zipped. The trees block the wind on the trail, and I quickly start to overheat from wearing too many layers; I do not operate well when I am overheating. I walk at a pretty fast pace. I grew up with a father that only operates in one gear: Go! 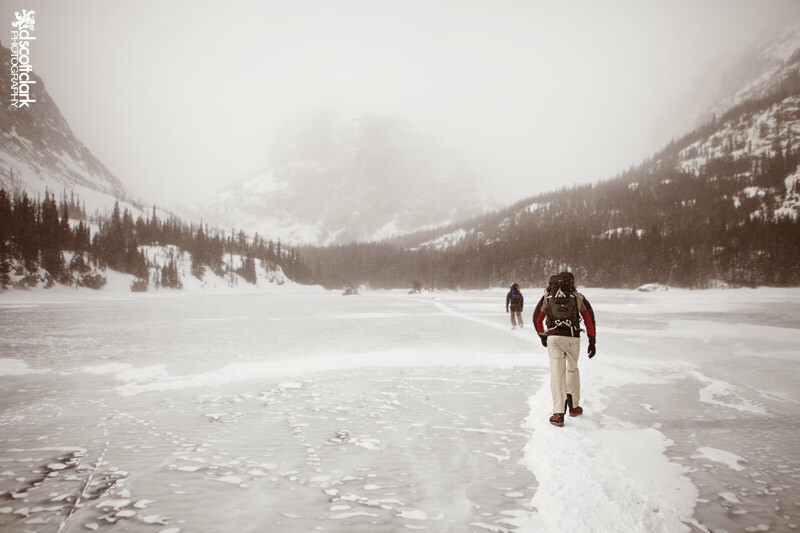 But I’m in the Rocky Mountain National Park to go ice climbing with Matt Lloyd and Colin Coulson, both of whom are quite a bit taller than me. And Colin has the same gear as my father, only with longer legs. He charges up the inclined trail. My lungs are still getting used to operating at high elevations, coming from a lowly altitude of only 900 feet for the last 26 years. Every step takes much more effort than it should. Every step Matt and Colin take puts more space between us. I try to charge faster but that only causes the fire in my chest to overpower my breathing. To make it worse, the knee deep snow forces me to expend so much more energy. 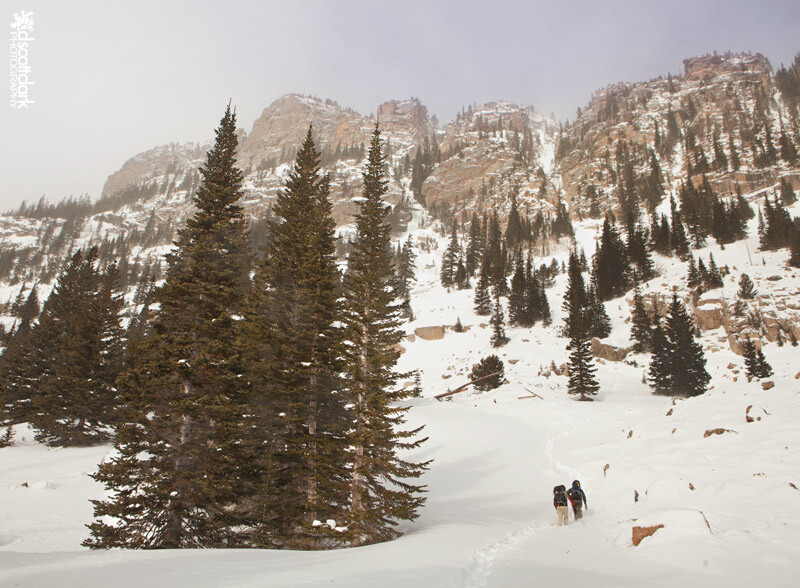 The snow is nicely packed on the trail for about the first mile, but as more variants split off the number of hikers and snowshoers that have gone before us dwindle until the trail becomes much less obvious. And difficult: we sink into at least our knees with every step (Makes me wish for some snow shoes, or I’ll take my skis and skins next time). We are greeted by blasting winds as we reach The Loch, a beautiful frozen lake nestled into the valley between rocky peaks. Leaning into the harsh winds we cross the lake, and above us, about half way up the mountain, we see an ice flow that’s formed out of a waterfall. This is our destination. 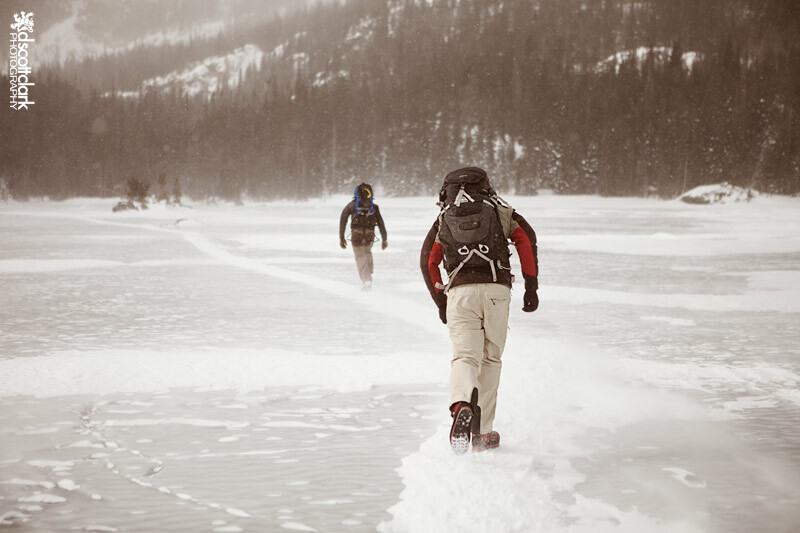 But we struggle through waist deep snow to finally reach the flow. 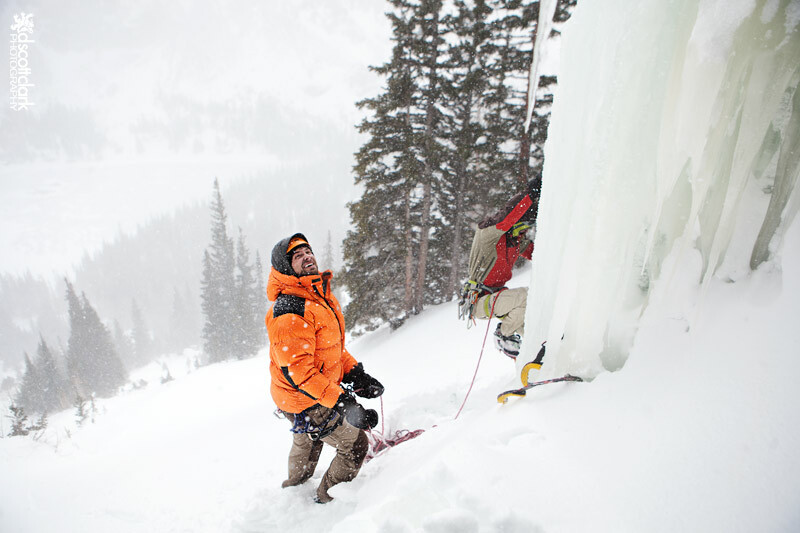 It’s shorter than it looked from the lake – only about 35ft tall – but as I have found in my little experience ice climbing, climbs tend to be more technical and challenging than they look. Matt jumping on “The Crypt”. We trek out the way we came in. 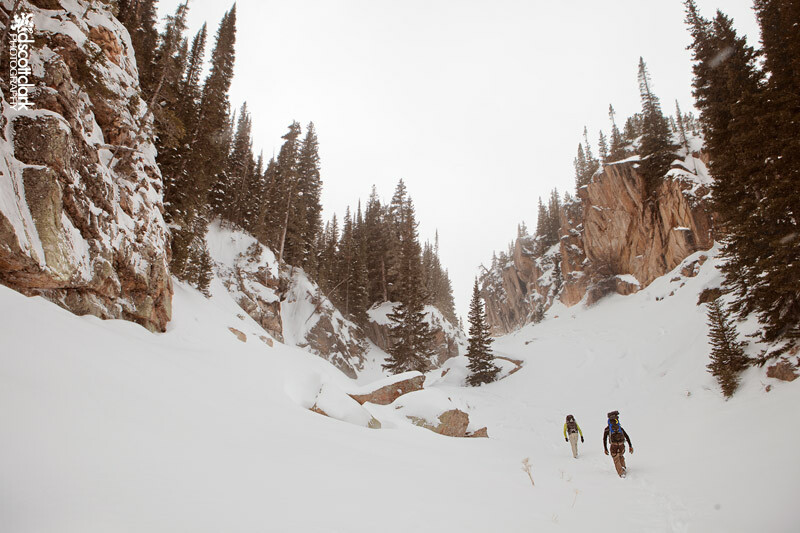 Thankfully a few more snowshoers had come up this trail making the hiking a bit easier. We tried check out another area, but the there was not tracked trail and we were all too tired to give it any real effort. I’m thankful to reach the car. Exhausted. 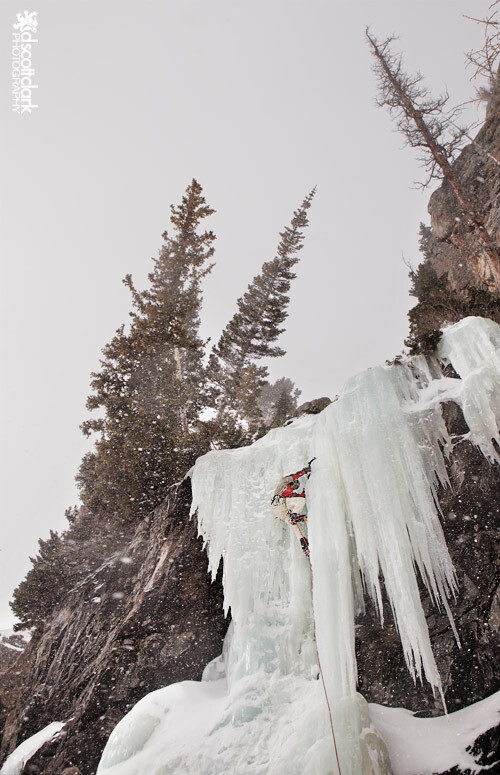 I’m pretty new to ice climbing. I started in January. I’ve found, in general, the approaches are the most exhausting part of the day. I feel comfortable, and probably blissfully & ignorantly confident, on the ice. I just recently did my first lead climb on a WI3+ in Vail. And I’m psyched. 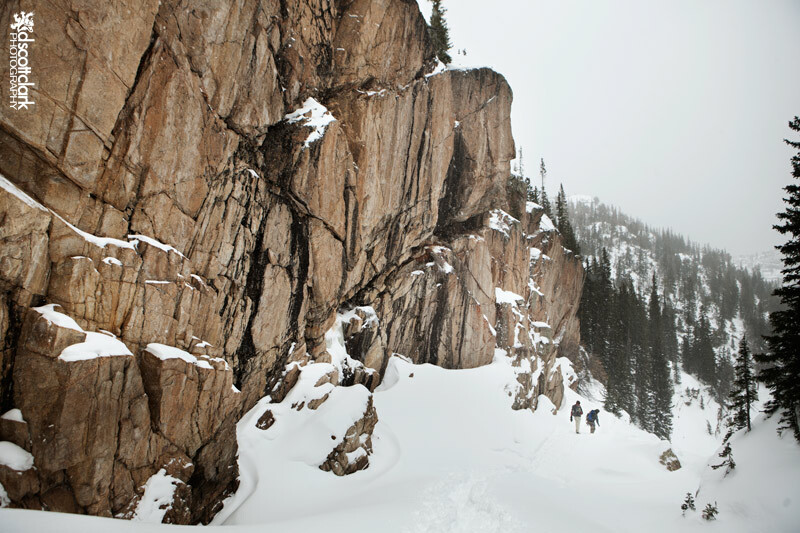 But unless you’re at a park like Ouray, the approaches tend to be the hardest part of the day for me. In RMNP 3 miles of hard hiking through deep snow has been the pinnacle so far. But there are so many climbs I want to do now, and the approaches seem to be the most daunting.